Photography is one of the most exciting hobbies you can pick up, but when you're first starting out it can all just seem so daunting. But don't get discouraged! It's important to remember that everyone started somewhere. There are no Mozarts in photography, virtuoso geniuses who were born knowing everything there is to know about the craft. More often we began like Beethoven, sitting at the piano in tears. But while learning how to compose a symphony would take years of practice, composing a great photo can be done at the click of a button—if you know what you're doing. Fret not if you don't, however, we've got some simple tips that are easy to remember, easy to follow, can be used with any camera, and will improve your photos in no time—no technical knowledge required. By using lots of exposure compensation toward the negative, we're left with a dark flower and bee silhouetted against the sky. This lets us just focus on the contrast and shape of the scene. The first thing you're going to want to know is that light is an elemental particle that exhibits wave-particle duality in accordance with the laws of quantum phys... Just kidding. This is the easy version. While you can spend literally your entire life studying the way light moves through the universe, you budding photographers just need to concern yourself with one concept: brightness. Ever walk into a dark room after being outside on a bright day? You know how your eyes have to adjust before you can see anything? Your camera is the same way. The world varies from very bright to very dark and your camera can only capture so much of this range in a single shot. Controlling this range is very simple to do and can be a powerful way to change the character of your photo. The easiest way to do this is with your camera's "exposure compensation" button, which is always signified with a +/- symbol. It might be a dedicated dial, a button on the camera, or an option in the menu. Whenever you shoot in an automatic mode on a camera, it tries to figure out how bright the scene should be. But cameras are dumb, and sometimes you have to nudge things in the right direction. Have a sky that's way too bright? Slide that sucker towards the negative. Trying to brighten up an area in the shadows? Move it to the plus side. Play around with it until you get the idea. Congratulations! You just figured out the most powerful concept in photography. By shooting when the sun is low we get a wonderful golden light as well as more interesting atmospheric effects. So now you kinda sorta get how light is affecting your shots. Now you want to go find it. Specifically, you want to find situations where light is dramatic. The best time to do this is during something called the "golden hour." The golden hour is simply the hour right around dawn and right before sunset. It's named this for the beautiful golden color the sun often takes on at these times of day. The golden hour is also important because it tends to create really wonderful shadows. While at noon shadows tend to be nonexistent because the sun is directly above you, at sunrise/sunset the sun is low. This low angle naturally creates shadows. That interplay between bright and dark areas is called contrast, and it tends to drastically improve the look of your shots. Carve out some time during the golden hour and you'll instantly see just how quickly the changing light will improve your photos. This shot gets on the dog's level for a much more interesting perspective, seeing the world how he sees it. Most of us see the entire world from between five and six feet off the ground. BOOOOOORING. While there are entire books on the creative use of perspective, how different lenses affect your perspective, and other wonderful tips, a beginner only needs to know one thing: experiment. Get lower, get higher, get directly above your subject, or directly below them. Zoom in on your subject, zoom out and show how your subject fits in the world around you. The beauty of digital photography is that you can constantly experiment. Stand in one place with a zoom lens and you can see the world in a hundred different ways. Stand in a park and you can turn left and see one landscape, or turn right and see another. You can get lower and see things from a bug's view, or aim downward and take a picture of your shoes. Always try to think up a new way to see what's around you. Do this long enough and you'll probably also see a crowd, gawking at the odd person spinning in circles in the park. By focusing on the blue shoe we draw the viewer's eye towards it, blurring out the rest of the background. When you're trying to capture something in a photo, you want that subject to be in focus so the details are crisp. On a smartphone this is easy; you just tap whatever it is you're trying to shoot on the screen. 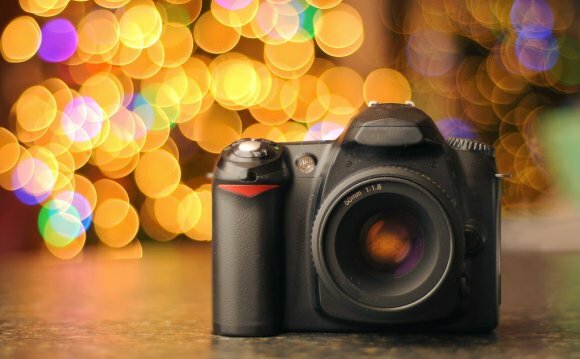 For other cameras it can be a little more complicated, but typically speaking if your camera has a physical shutter button, you can focus by holding the button halfway down. When the camera thinks it's locked in it'll usually surround the subject in a green box of some sort and give a cheerful beep indicating everything's good to go. Press the button the rest of the way and voila, you've got an in-focus photo.